Anti-Semitism had existed since the beginning of the Jewish faith. There is growing anti-Semitism around the world now in 2016. There is also an ongoing trend amongst young people that think it’s “cool” to hate Israel. I want to shed some light on this subject and also on the State of Israel. There is a lot of anti-Semitic and anti-Israel propaganda that still goes on around the world. One of the core messages is that Israel was stolen from the Palestinians. Israel was not stolen; Zionists bought the land from the Ottomans and the British who ruled it at the time with the Jewish National Fund. Most of the land that was purchased was mostly uninhabitable swamplands, which were industrialized later from scratch. Zionists did not have an army to win Israel by conquest, and even if they had an army, the State of Israel would not be legitimate as it is today. While many countries within United Nations abstained and many objected, enough countries supported the partitioning of a largely uninhabitable piece of land to allow for the creation of a Jewish homeland. The final vote came out in favor of creating the State of Israel on November 29th, 1947. However, since the formation of Israel when the British Mandate of Palestine gave up power in 1948, it followed by an all-out attempt by Arab states surrounding Israel to expel the Zionists, which Israel had to defend itself. In today’s world Israel is always being politically attacked by most of the civilized countries for practically everything. There is also a notion that Israel is doing everything only for itself. With enemies surrounding Israel from all sides, and countries like Iran that are dedicated to Israel’s destruction and are now on a verge of nuclear power, can you really blame Israel for trying to stay alive? What about United States of America? Aren’t we also doing everything for our own political and economic self interests, while acting like the police of the world? If not, then why didn’t United States government admit to the Armenian Genocide in 2015, which, marked 100th year of the genocide? I believe the reason why United States has not admitted to the Armenian Genocide is because Turkey is an ally they have in the Middle East that is close to a potential opponent; Russia. If United States condemned Turkey for their crimes against humanity, Turkey would automatically tell United States to get their bases out of the country. United States strategic base area in Turkey gives them a lot of power in the region. I have close friends who are Armenian, and this offends me not only because of that, but also as an unfair treatment of the Armenian people. Also you see the United Nations condemning Israel for being fascist against the Palestinians for defending itself against the terrorist group who govern Palestine called “Hamas”. Hamas, who use women and children as shields by putting their military equipment near and in Palestinian schools and hospitals. If for some reason Canada or Mexico attacked United States tomorrow, and United States would respond with military action, UN wouldn’t condemn United States because of that. In today’s world, Israel is being blamed for things like self defense when it’s completely accepted if done by other countries. Also, how Israel oppresses the Palestinians was a big topic in European countries that blamed Israel and Jews for support of Israel. Palestine is not inclined to creating peace with Israel, instead their prime objective is to destroy Israel and exile all of the Jews. Israel’s occupation in the West Bank is what most countries blame Israel for not being able to make peace with Palestine. The PLO (Palestinian Liberation Organization) was created in 1964 when the entire West Bank and Gaza was Palestinian territory. The PLO was created to remove by force the entire Israel map from the Middle East, which was a goal, stated in their charter. This goal wasn’t new, they were continuing Arab history saying no to the national determination of the Jewish people and no to recognizing the ancestral Jewish homeland. In 1937 the Peel Commission recommended a division of the land between the Arab portion and the Jewish portion. The Arab portion of the land would include 96% of the territory, which the League of Nations designated for the Jewish homeland. This included far more than just the West Bank. However, instead of accepting the Jews as peace partners, the Palestinian leader Haj Amin Al-Husseini said no, and partnered up with Adolph Hitler by pitching to him an idea of ethnic cleansing of the Jews in the Arab world. In 1947, United Nations recommended a Partition Plan, which again offered the Arabs far more than just the West Bank. The Jews said yes, the Arab leaders again said no and launched a war of extermination of the Jews. Israel won that war, established a state, but didn’t know a day of peace despite the fact that their Arab neighbors held the entire West Bank. The Arabs launched missiles from the West Bank onto Israel, when Israel took it over in a self-defense war, which happened in 1967. After the war, the Arabs rejected all attempts at peace with Israel. The Arabs didn’t recognize Israel as a legitimate state, didn’t want peace with Israel, and didn’t want to do any negotiations with Israel. Fast forward to 1993, when Palestinians were given sovereignty over West Bank cities and Gaza. For the next 5 years, Palestinian suicide bombers kill indiscriminately in Israeli towns. In 2000, Israel agreed to give 94% of the West Bank. In the next 3 years, Palestinians exploded buses and cafes in Israel, killing over 1,000 Israelis. In 2005, Israel withdrew from Gaza, and removed all Jews. Since then, Hamas has launched over 13,500 rockets into Israel. In 2008 Israel gave in to all of the Palestinian demands of giving them almost 100% of the West Bank, but Palestine refused. In 2011, Israel released more than 1,000 Palestinian terrorists. Hamas built attack tunnels to terrorize Israeli civilians. Palestine was never and still is not inclined to realizing the legitimacy of Israel. If they could they would carry out a second Holocaust since they have a born hatred towards Jews and don’t want them to be their neighbors. Israel however has proven that they can have peace with neighbors by signing peace treaties with Egypt and Jordan. Now since the recent terrorist attacks in Europe, suddenly the European politically correct government officials are beginning to ponder about whether Israel is really to blame when the same things are happening to them. You cannot really blame Israel for having a national Jewish identity. This is due to the fact that Jewish communities do not feel fully welcome in most of the world’s countries with their own ethnic/national identity. The only three multi-cultural countries where Jews are more so accepted are United States, Canada, and Australia. Although it’s a lie that Israel is apartheid state when all three religions: Christianity, Judaism, and Islam all co-exist within the state. Israeli hospitals don’t treat Palestinians as second-class citizens. However, if the roles would be switched, an Israeli Jew would never even make it to a Palestinian hospital. Israel has the right to exist because it is the only thing that stands between the 2nd Holocaust occurring. (The Holocaust during WW2 was not the first genocide of the Jewish people. Ancient Egyptians and Romans also nearly wiped out the Jewish population as well as the oppression the Jews felt through out the centuries and the millenniums.) It is a haven for Jewish people, to prevent complete annihilation with the world that hates Israel and Jews. A world that justifies hate against Jews with anti-Israel and anti-Semitic propaganda. I did this painting from an old 1940’s photograph because I wanted to viewers to connect with a real life event that took place, opposed to staging it with models. This was a very low-resolution, gray scale photograph. My plan was to bring this event back to life with as much detail as I could possibly represent in this image. (This painting is much more detailed than the photograph, which is very pixelated.) This shows Holocaust victims getting off of a train to march to their deaths in Birkenau concentration death camp, which is the part of Auschwitz where they executed prisoners. I made this painting with a graphic element in mind. 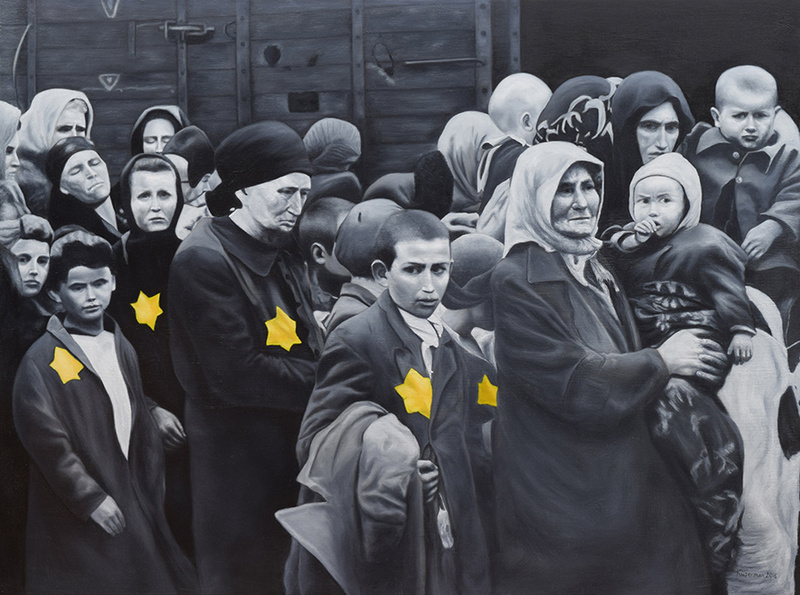 Everything painted in gray scale except for the yellow stars of David, which pop at the viewer. This modern tragedy had happened considerably not so long ago, however the world seems to forget very quickly and the choose the easiest scape goat of whom are the Jews to blame for many of the problems. Of course out of 14-20 million victims of the Holocaust 6 million were Jews. (Although Jews were the primary target of Hitler and the Nazi Party.) That was half of Jewish world population at the time. (Mostly all the European Ashkenazi Jews.) Other groups that were persecuted by the Nazis were: homosexuals, Jehovah’s witnesses, Polish people, Gypsies, black people, Soviet prisoners of war, and the disabled. I want to say that I support existence of Israel, and did this piece to stand up for what I feel is right to promote awareness on this topic. I did this painting in my attempt to put out my statement on the subject matter so it never happens again. The only way it won’t happen again is if Israel will continue to exist. This piece is also a commemoration to ALL the victims of the Holocaust. I am stating all of this in an unapologetic manner. NEVER AGAIN. I would also like to share how this work was inspired. When I was about 14 or 15 I visited Germany with my dad. I met up in Germany with my aunt, uncle in law and cousin who currently live in Israel. One of the days I visited Dachau memorial park with my dad. (Dachau was the first concentration camp in Germany, which was converted into one from a train station.) I got an entire tour and got an explanation first hand of the kind horrible things that happened there. I also felt a little odd when I saw people standing in front of gas chamber, and the ovens who took photographs with a smile or selfies for social media. When I was about 16 years old I had a really vivid nightmare. I was running through the streets of Europe, somewhere in Germany or Poland. There were Nazis running after me with dogs. I recall jumping off of a bridge that had trees and a forest underneath. After the jump, I broke my legs. Suddenly moments later, I recall dogs tearing into my body. I felt the pain in my dream as if it was really going on. I cried in my dream, “God, please help me.” I then, woke up in the middle of the night in cold sweat. Where the dogs bit me, my body parts felt numb. Another Holocaust dream I had, which actually inspired this painting happened right before I began working on it. (It was the morning of Friday, July 17, 2015.) I recall having a dream of Holocaust victims getting off of a train in Auschwitz. In the back, there was Oscar Schindler observing what was going on. When I woke up from my dream, I decided that it was what I needed to paint. I then began to do my research and started on the project that morning. Please share this article/post. I have done this painting and description to bring awareness to the current situation happening in the world right now with the rise of Anti-Semitism around the world. I put my heart and soul into this painting and project. We live in a strange world where the most loved person ever was a Jew who lived 2000 years ago ( Jesus Christ ) and the most hated group of people are also Jews. The painting technique aspect of this painting was inspired by the Baroque Dutch school, specifically young to middle age Rembrandt van Rijn. A time lapse video of the painting with the genius music of requiem by Giuseppe Verdi. Slide show of the painting’s details, accompanied by the genius music of John Williams from Schindler’s List.